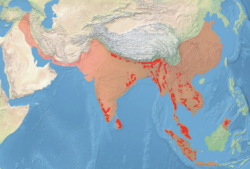 Distribution map's microevolution of Asian elephants (Elephas Maximus) between the begining of 20th century (pink) and early 21st century (red). In biology, more particularly in population genetics, a population is the sum of all organisms of the same group or species living in the same geographical area, bearing capability of interbreeding. In a similar definition, a population is a group of individuals pertaining to the same species living in a defined geographical area and effectively or potentially interbreed. In sociology, population refers to a set of human beings. In statistics population refers to a finite or infinite collection of items under consideration. Allopatric populations: those that are physically separated, for example by geographic barriers. Parapatric populations: those that largely are physically separate but has a small overlap zone where can occur the gene flow. Sympatric populations: those who are not physically separated. ↑ Klug, William S.; Cummings, Michael R.; Spencer, Charlotte A.; Palladino, Michael A (2012). Concepts of Genetics (10th ed.). Boston: Pearson. p. 698. ISBN 978-0-321-72412-0. ↑ Ringo, John (2005). Genética Básica [Fundamental Genetics]. Rio de Janeiro: Guanabara Koogan. ISBN 85-277-1100-1. This page was last modified on 7 October 2014, at 15:07.